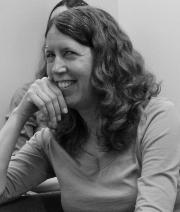 Ellen Dodge received her master’s degree in linguistics in 2002 and her doctorate in linguistics in 2010, both from UC Berkeley. She has been working within ICSI's Artificial Intelligence (AI) Group since 2000, initially as part of the Neural Theory of Language group, and also as a researcher within the FrameNet project. She is currently the primary linguist working on the continuing development of Embodied Construction Grammar (ECG) at ICSI. She has written and presented numerous papers on ECG, and her dissertation provided key insights into the conceptual and constructional composition that are at the heart of this grammar. Since its beginning in 2012, she also worked on the MetaNet project at ICSI, which has developed formalized representations of frame and metaphor networks, as well as methods to identify and analyze metaphors within text. Particular areas of current interest include constructional analyses of metaphor, the further development and expansion of ECG, and the analysis and representation of conceptual networks, with a focus on conceptual primitives.